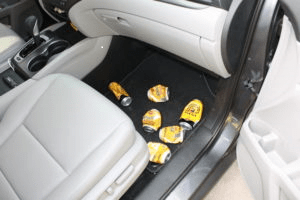 Drunk Driving Accident Lawyer | Simmons and Fletcher, P.C. Drunk driving accidents are a real problem in the State of Texas and are responsible for numerous serious injuries and deaths. Reports from the Texas Department of Transportation show that there are over 15,000 collisions involving drunk drivers every year. Further, 3773 people lost their lives in auto collisions involving drunk drivers in 2016 alone. If your life has been turned upside down by the grossly negligent conduct of a drunk driver, you need a drunk driving accident lawyer who will fight for the justice you deserve. Call Simmons and Fletcher, P.C. today at 1-800-298-0111. Causing the death of a person while driving under the influence of drugs or alcohol is a crime known as intoxication manslaughter and is punishable by jail time in the State of Texas. But sadly, this statute has wholly failed to be an effective deterrent against those who chose to consume more than the legal limit of alcohol and get operate a car. Unfortunately, in the vast majority of cases the actual damages and injuries that a victim of a drunk driver sustains is compounded by the fact that the irresponsibility and negligence of a person who drives while intoxicated tends to extend to other areas of that individual’s life. Often a person who will get behind the wheel of a car, endangering the lives of people like you and your children, will not have enough (or any) automobile insurance. Due to the lack of sufficient insurance issue often faced by the victims of drunk driving accidents and the serious injuries drunk drivers can cause due to their extreme gross negligence, our drunk driving accident attorneys understand the need to pursue other avenues of recovery on your behalf. This includes negligent employers who over serve employees at work functions, as well as bars and restaurants that serve alcoholic beverages to already intoxicated patrons. You must have a drunk driving accident lawyer who will consider all the options and answer all your questions. What is a Dram Shop claim? Can I file an Uninsured or Underinsured Motorist claim? Call us for a free consultation if we may help you consider your options. Was the drunk who turned your life upside-down overserved by a bar or restaurant that had no concern for threat they created by over serving the drunk driver? Watch the video below to learn more about drunk driving accidents and how a Dram Shop attorney can help you hold the people who put the drunk driver on the road responsible. At Simmons and Fletcher, P.C., we have a team of drunk driving accident attorneys that stand ready and able to fight for your rights with dispatch and integrity. Although on the surface a lawsuit for injuries caused by a drunk driving accident may seem cut and dry; the reality is that these types of cases require detailed investigation. Simmons and Fletcher, P.C. is here to help. Contact Simmons and Fletcher, P.C. today for a free consultation regarding your case. We help drunk driving accident victims statewide. Call us at 800-298-0111.